Preheat the oven to 160°C/320°F. 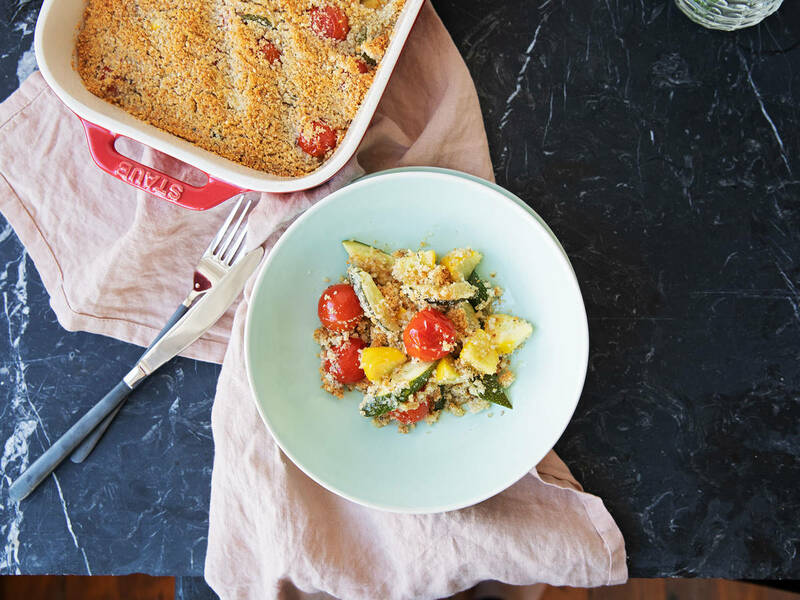 Slice summer squash and zucchini and add to a baking dish along with cherry tomatoes. Drizzle the vegetables with half of the olive oil, season with salt and pepper, and transfer to oven. Roast at 160°C/320°F for approx. 30 min. In the meantime, add Pecorino cheese, garlic, hazelnuts, breadcrumbs, and thyme to a food processor and pulverize to combine. Remove baking dish from oven and increase temperature to 200°C/400°F. Sprinkle the Pecorino-hazelnut mixture on top of vegetables and drizzle with remaining olive oil. Transfer back to oven and bake for another 15 min., or until golden brown on top. Enjoy!